First on the list, I've moved! Half way across the world, but from one island to another. I am now on the island of St. Croix in the Virgin Islands. This is my home base while I continue to work on my business. One of the big benefits of being here is being closer to the people and events that are becoming a bigger and bigger part of my life. Getting off of Guam to go anywhere can easily cost a couple thousand dollars. Now I am able to fly for much less, which is a good thing because I am going to Chicago in July, Spain in September, and Nashville in November - all for different business conferences and retreats. I don't share enough pictures of ME, so here is on on the night before I left Guam with my fiance and best friend. Can you see the ocean? This is St. Croix. 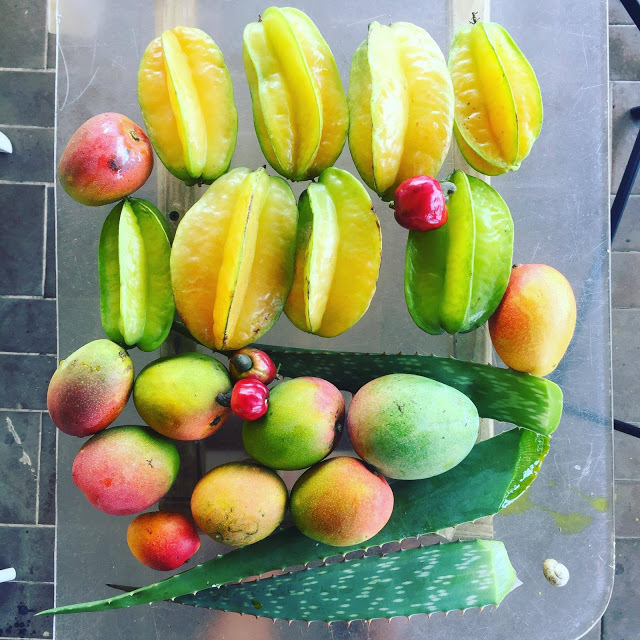 I've been eating fruit off the tree every day since I got here. On the note of "taking 100% responsibility for my life," I've definitely been focusing on my health. My diet is a lot cleaner now (no more daily runs for sugary lattes here) and for the first time ever, I've been exercising every day without fail. Exercise is something I've always struggled with, but I've decided to just embrace getting sweaty (LOL) for a season of my life. What has been working for me is Fitness Blender from YouTube. I've mentioned them before, but I decided to move on from their free workouts on YouTube to their paid programs in which they actually curate the videos for you. This way I don't have to think at all, I just press play and I know I'm working out in as smart a way as possible. This fitness journey has shown me how taking 100% responsibility for our life in all areas is a cycle that we go around and around, higher and higher. What worked before, won't work today and we have to keep asking ourselves "Is this working?" and we have to keep tweaking to be at an optimal level of performance - whether it's in our financial health or physical health. Look at that cute thing. I've minimized to an A5 size version of my Life Binder. I still have the regular 8.5 by 11 size that I've used for years, but it is full of printables that I only have to revisit a couple time a month. This little one is something that I crack open constantly throughout the day and am able to carry in a bag much more easily. My future dream is to create physical Life Binder kits to sell in my Etsy store - complete with pretty dividers, tabs, stickers, and printables. I currently only sell the digital downloads, but I know there are people who would love something that they could buy ready-made like this. And I enjoy working with physical products so hopefully by next year, I can have this be a part of my store. I've been planning like a beast lately - for the last few months actually. My room here has white poster paper wherever I could tape it up and I am mapping out everything. I have big goals and it's time to make it all happen. My biggest goal right now is to upgrade my SOS Club to a 12 month program that is designed to REALLY help people take 100% responsibility for their life. I remember when I started this journey 6 or 7 years ago. I got tired of the rut I was in and I took evening a week to address my life. To add direction and structure, I purchased a 12 month program by Jim Rohn called "Your Best Year" or something like that. It sent me something to focus and work on every week. I really like that it was 12 months, because it was about turning your LIFE around. I want to do that for other people - help them have a mindset revolution and be with them on a journey for 12 months. I'm really excited and am putting the pieces together every day. Here is a pic from the inside of my little life binder. One of the things I am working on right now is THE 4TH EDITION OF THE LIFE BINDER! Every year at this time, I launch a new and improved version of the Life Binder - which I give for FREE to everyone who has purchase a previous edition of the Life Binder from my Etsy store in the past. Throughout the month of July, I send the updated version to all my Life Binder customers via their Etsy inbox. It's a rather tedious process because I can't message everyone all at once - I have to do it one by one and it could take a few days. But it's worth it! 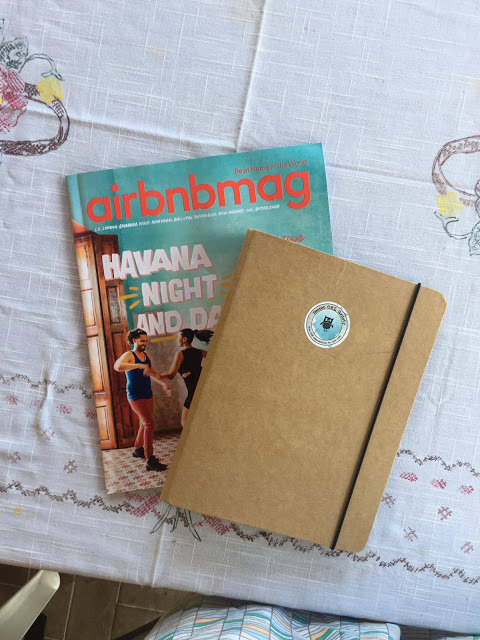 :) I have an idea that will make it easier moving forward - I'm going to create a Life Binder hub of sorts so that Etsy customers can log in to get the new edition every year instead of me having to message everyone one by one. Anyways, lots in the works! 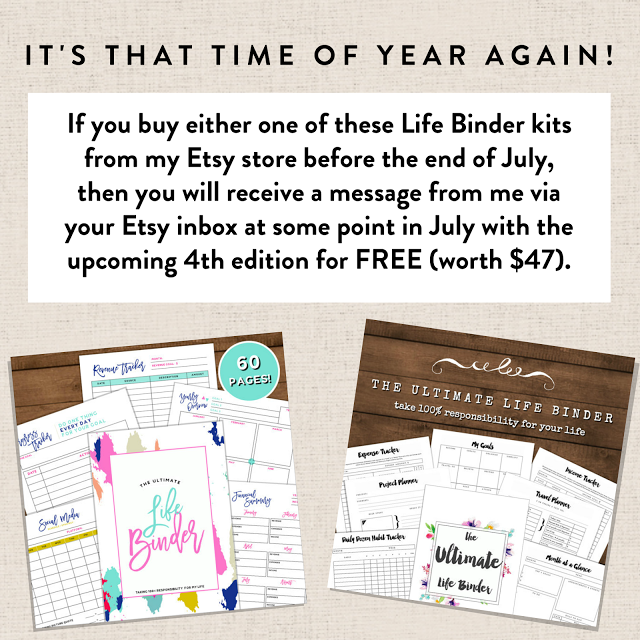 If you haven't purchased the current editions of my Life Binder yet (I have a $21 version and a $41 version, go for it now and you will be on the list to get the 4th edition (worth $47) for FREE in July.